They have a devoted following among anglers, since they’re such a challenge to catch. When you hit Texas’ lakes and rivers this summer, be mindful of the fact that you may be sharing the water with dinosaurs. I’m talking about gar here, a gigantic fish that dates back to the cretaceous period but still stalks Texas waterways. Its numbers declined during the 20th century due to overfishing and dammed rivers. But that didn’t upset most people. The gar doesn’t have the best reputation around these parts – and changing that might be the best way to save them. On a sunny weekday morning, Tommy Dukes is fishing on a stretch of the Colorado River that runs right under Interstate 35. He’s fishing for bass, but I’m interested in gar. He says he doesn’t know too much about them, except that he doesn’t want any. Gar aren’t known as a culinary delight. And they look dangerous. The biggest ones measure over seven feet, their scales are sharp, and they’ve got a long snout. Dan Daugherty with the Texas Parks and Wildlife Department is one of the Texans responsible for improving the gar’s reputation. 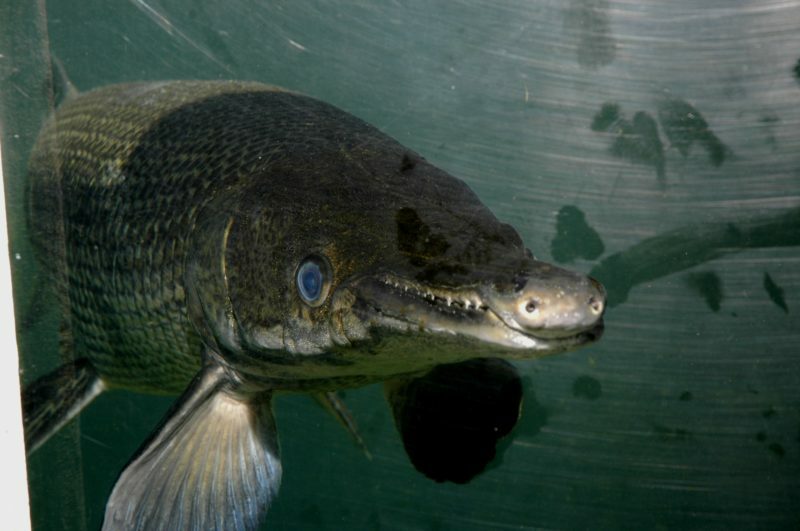 “I guess I would describe gars in general as a fish with a face only a mother could love,” Daugherty says. It wasn’t all that long ago that state agencies were killing gar, not protecting them. People thought gar mostly ate bass and crappie – valuable species for the fishing industry. “And it resulted in not only anglers but also state and federal management agencies taking actions to reduce alligator gar populations in order to reduce their numbers and potential impacts on the more valuable sport fishes,” Daugherty says. In the 1930s, the Texas Game, Fish, and Oyster Commission even created the “electric gar destroyer.” It shot a current into the water to kill gar. And it worked. But later research showed killing gar is an ineffective way to save game fish. They’re actually only a small part of the gar’s diet. And that scary, aggressive reputation? It also turns out economically and ecologically, gar are valuable. They control the population of species like suckerfish and carp. And they have a devoted following among anglers, since they’re such a challenge to catch. Other states have restricted or banned fishing for alligator gar, the biggest subspecies, because their populations are so low. But in Texas you’re allowed to catch one per day. He hopes the more popular the gar becomes to catch, the more people may want to protect them. And that starts with thinking that maybe they’re not so bad.